Ibiza Bridal Week is the first and only of it’s of its kind in Ibiza. The boutique fair offers the ultimate wedding inspiration, where the most prestigious and renowned vendors on the island come together for an elegant weekend with ideas that will expand your vision and personal wedding style. Ibiza Bridal Week launched in 2015 and are now in their 4th year running. The fair has certainly secured itself as a well-established, respected event with a great focus on “what’s trending” within the wedding industry. This year was the first to bring together a grand total of 18 brands – not bad for our little Island. And that’s where we come in – it was our first year attending IBW. Needless to say, we didn’t just sit back and enjoy a glass of sparkly. Velvet Circus had an allocated spot as all vendors do. However, we also had the honour of styling the entire event within the Palacio De Congress De Ibiza. Guests were very much welcomed with a little piece of our world, skills and designing from the moment they walked through the door. Everything was incredible and we were very happy with the outcome of all our hard work. It was a magical highlight for Velvet Circus to have had such a big role within IBW 2019. 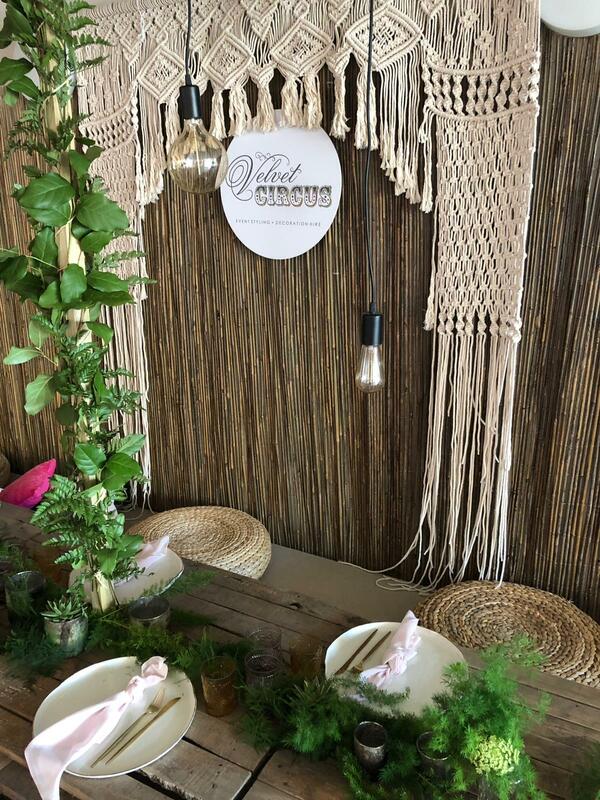 We opted for a style that blended bohemian-chic. A little more natural, traditional Ibiza mode. 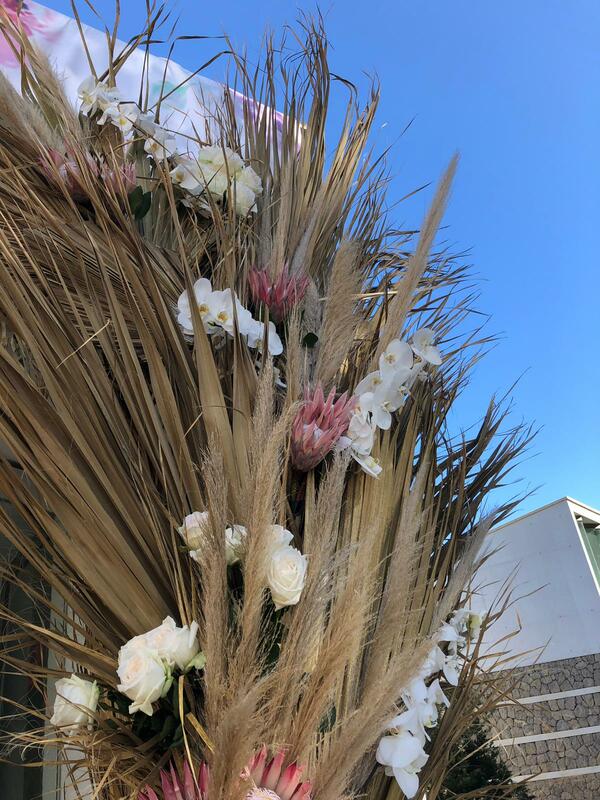 Our base setting was plenty of large dried palm leaves hued with tinted pink and laced with together with blush pastel and natural white flowers. Throughout the arena we weaved bold rays of velvet chairs, earthly patterned seated cushions, colourful vases and finished up with some large, deep bottle green cactus plants. 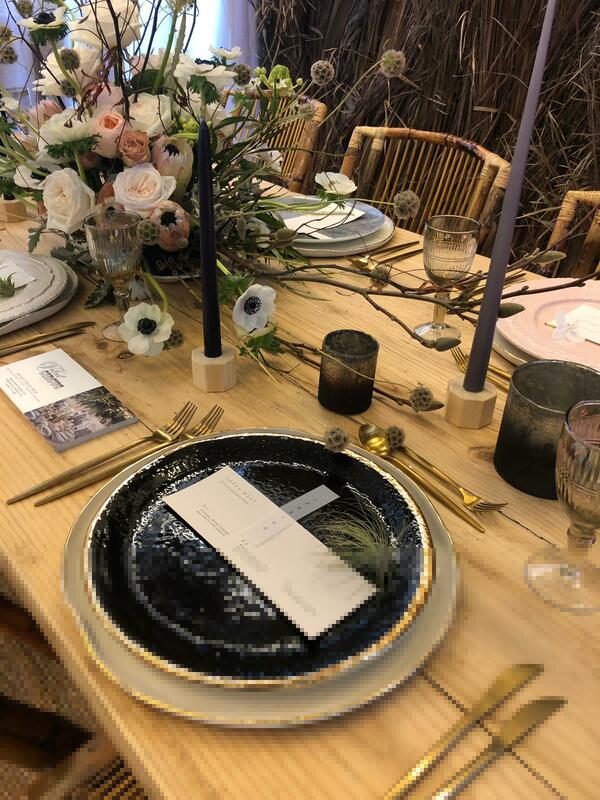 Our expert team put together more than just gorgeous, custom decor and floral tablescapes that composed of beautiful pastel and grey ceramics, gold cutlery and colour-matching flower centerpieces. As with any wedding; taking pride in our creativity and paying exceptional attention to detail was paramount; everything from chair covers, table runners, napkins, flowers and much, much more. We were constantly on the lookout for the latest up to date trends in our style and rentals to add to our inventory and portfolio. It was truly a great weekend. The two days also allowed us a little bit of extra time to network with other companies in the sector. We met and spoke to some really talented suppliers, designers and florists to say the least. We were beautifully situated next to our friend and business collaborator the “Ibiza Chair Company” which only added to the days fun and set even more inspiration and mood boarding in the creative minds of our team. What an amazing collection of great chairs for all events and occasions! We truly hope everyone had as much fun as we did… and we certainly hope to return again next year! Thank you to everyone at Velvet Circus and at Ibiza Bridal Week for all your hard work and creating a wonderful first year for us all. And on a really “Special Thank You” note. Marina from Ibiza Wedding Planner and Holly her right hand girl. 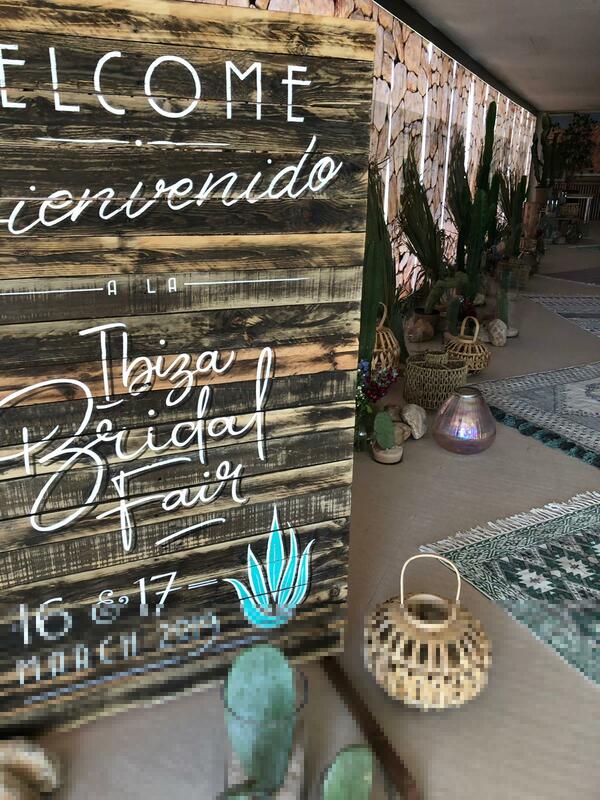 Thank you so much, with you everything has been possible for this year at Ibiza Bridal Week.